It was less than two of months ago that we posted good news of Beanie, one of the stars of the Mad City Chickens documentary. She'd recently moved to a new southern California home and was doing fine. But sadly, we just learned that shortly after her move, Beanie became sick and two weeks later she passed away. 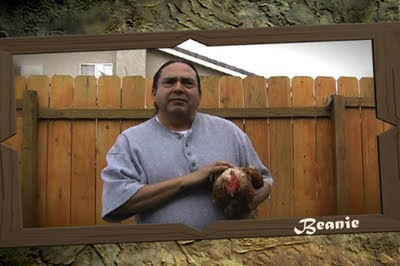 When we first witnessed Beanie's unique talent (among chickens), we knew that she had to be in the film. She had a kind of presence on stage, and she really seemed to love playing the piano. Her short performance is always one of the segments people remember. James Walker, Beanie's trainer wrote us that her passing has made your movie extra special. I really appreciate you including her. I had wanted her to play at Carnegie Hall (via green screen magic), so seeing her playing for the enthusiastic audience was the next best way to see this become reality. James posted the sad news on Beanie's blog, but this may not be the end. Before she died, Beanie was joined by several new poultry friends that are now interested in learning how to play the piano too--Einy, Miney and Mo. (Meany was a rooster, who was voted off the property because he didn’t play well with others.) Plus, James has indicated that a new Beanie may be joining the flock to carry on the legacy. Beanie will be missed, but not forgotten.